Check out the NEW LED Database! The lights listed below are from NAB 2015. We have posted the NAB 2016 results — every brand of LED light at the show, over 160 lights from 65 brands — in our new LED Color Quality database, since we used a more advanced spectrometer. We recommend checking out that database for all of the current LED lights on the market. The 2015 database is still a very good resource for those purchasing LED lights made during that year. Since LED technology is continually improving, current generations of lights will most likely be higher quality than previous generations of LED lights, such as those listed below. This most likely explains why the below data may not agree with measurements from current models, even if the model has the same name. What is important is the LED diode/emitter within the light fixture, which most likely is regularly updated. Jump ahead to the results! Daylight and tungsten light are the two most accurate sources of light. Every color reading lines up to an almost perfect 100, which means colors will be reproduced accurately. The graphs of these two light sources are the standards by which all of the LEDs below should be compared. These measurements were taken with a Sekonic C-700 Color Meter . Pay close attention to the R9, R13, and R15 readings, as these values tend to be weak points for LEDs. The closer these values are to 100, the better your skin tones will look on camera. All color readings were taken with the Sekonic C-700 color meter placed directly in front of the light source (approximately 12 inches away). All readings were taken at NAB 2015, unless otherwise noted. The showroom floor of NAB was lit by sodium vapor lights which hung roughly 20 – 30 feet above. As you can see by the example below, there were minimal differences in readings between the NAB show floor and our controlled environment. Assuming that every manufacture brought the best of their LED inventory to NAB 2015, our color rendering readings should be representative of their LED inventory. Color readings in the database marked with an asterisk (*) were taken in our controlled environment, a completely black studio with no other light source other than the LED being tested. For controlled tests you can see our studio environment in the “Are LEDs Ruining Your Projects” video. Why Take Readings At NAB? 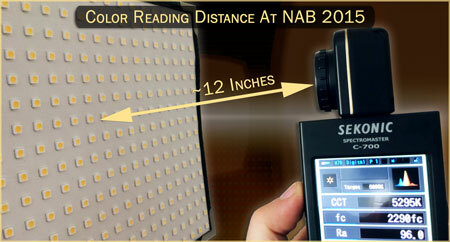 We had two reasons to take our LED readings at NAB. First, it was a great place to sample a wide range of LEDs in an efficient manner. Second, all of the LEDs were in the same environment, so they all had to overcome the same sodium vapor lighting that hung above the show floor. For those concerned that the sodium vapor lights contaminated the results, consider this logic: if an LED light cannot overcome the sodium vapor lighting that hangs about 20 – 30 feet above the showroom floor when the color meter is placed 12 inches from the light, then it is not a light worthy of video production. While we freely acknowledge that this is not the ideal testing environment, we do feel that it does reflect a real world mixed lighting environment often found on location. Now that you understand the issues behind LED lights and how we took our color readings, it’s time to look through the results! I am the engineering manager for Litepanels and I am going to cast a serious doubt on your measurement of the Astra. I cannot comment on sources of error at the NAB show, your logic with the sodiums is sound, but your result with the Astra is wrong. I’ll explain. We test all of our products to the TLCI “extended color gamut” rating. The Astra scored at an astounding 99/100. I’ll admit that we would normally be around 98 or 97, but the fact is that our custom LEDs we use have amazing color, and they are dead consistent. I would cite our R9 and others but i am on the road and don’t have that info handy. i will say that I have memorized our spectrum and you show a green bump that is not from our panel. I suggest that you consider re-evaluating this light, or take it off of your site. It is misrepresentative of the truth. But you should prove that to yourself and not take my word for it. I’m sure we can arrange a unit to test, or better yet, come to our office in Chatsworth and you can chose a light. We do not cherry pick, they are all great. That is an invitation. It is great to get your input. We too were surprised at our readings for the Astra. I have temporarily removed our Astra results from our LED Database page until we are able to retest the light. Thanks for your comments. 🙂 While we were surprised too, our methodology applies the same to all of the lights we tested, and we used the Sekonic C700. So I’m curious as to what the variable would be. We would be happy to retest your light and publish the results. We also have the Lighting Passport, so now we can take the TLCI reading too. So, I have several Westcott Flexlite panels. Your tests indicate an R9 reading of 78(red?). Based on it’s distance from 100, would I need to make corrections to achieve better results when using these lights, especially for skin tone? thanks so much for the great content, I joined last week. There isn’t much you can do to make corrections, since many gels for this type of situation only correct color temperature. There are some gels coming to market that correct for some LED issues, but at the same time you can’t add color that isn’t there. The only way is to decrease the other colors so they all balance together better. All that being said, the Westcott Flex Light is a great light, one that we use ourselves. 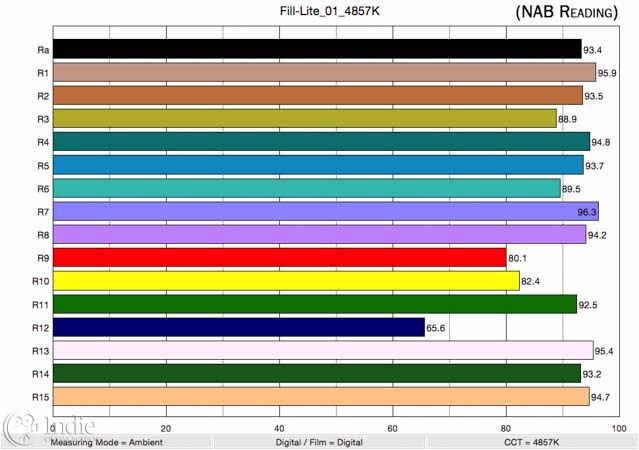 We also use the Fill-Lite brand of lights a lot which has similar R9 values. We don’t make any corrections for either light. While other lights like the Aputure have much better R9 values, if you are happy with what you are getting for skin tones from your Westcott, don’t worry about it. The R9 value is for saturated red, and so some feel that it isn’t as crucial for skin tones as it is for strawberries, red apples, stop signs, etc.